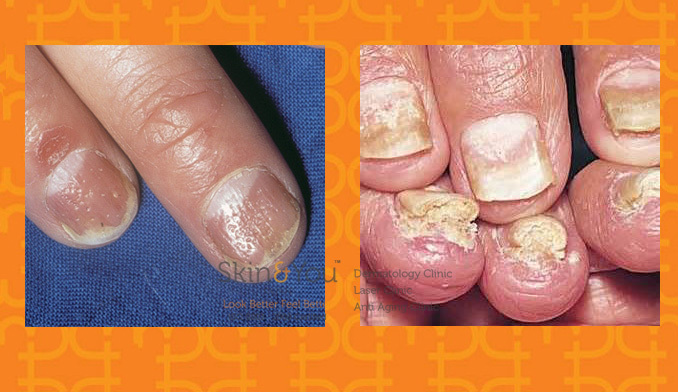 Psoriasis can affect fingernails and toenails in 25% of cases. 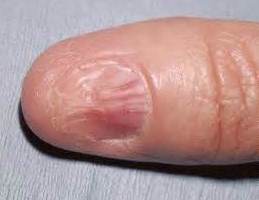 Splinter haemorrhages and false nail following spontaneous separation of nail plate. Thinning, brittleness, crumbling of the nail with accentuated surface longitudinal ridging. Colour change to black or white. Chronic inflammation causes either partial or complete loss of nail plate and formation of pterygium with partial loss of central nail plate seen as distal notch or completely split nail. 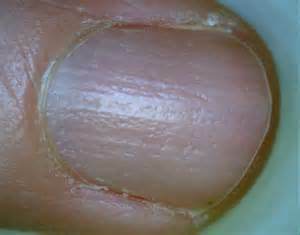 Involvement of nail bed causes onycholysis, distal subungual hyperkeratosis, formation of bulla or permanent loss of nail. Depending on duration , various causes, symptoms, appearance, any co-existing medical illness or skin disease, medications history, occupational details, diagnosis is made and if any underlying condition is present it is addressed immediately. Based on causative factors it can be combination of oral and topical treatment – such as topical and oral antifungals, topical and oral antibiotic, nail supplements, or steroid based injection to control the progression of disease such as in cases of psoriasis.